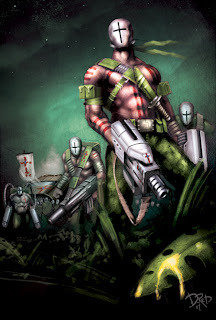 Astral Crusaders say "Recant or you'll die"
If you are not homosapien - you're dead! The above describes the Astral Crusaders in a nutshell. They are the last bastion of humanity. A well trained force defending and upholding the values of the human race throughout the cosmos. Earth has long since disappeared, presumably destroyed by the alien attacks. Humanity only remains on the colonised planets and moons throughout the known galaxy. Close encounters proved to be a little too close for comfort. ASTRAL CRUSADERS ARE COMING... PREPARE TO BE CLEANSED!!! The Standard Bearer is a six page mini epic that will introduce the Astral Crusaders to the big bad world. It is to appear in Indie Comics Magazine issue 3. So make sure you all pre order a copy from your local comic book shops. This print will be in black and white and the cover to the story appears above (it will be B & W in the magazine). This Blog is the only place that you will see it in all its glorious color. I will post some more images after Indie Comics Magazine issue 3 has been released. Don't want to spoil your fun.